With Microsoft officially ceasing support for the antiquated Windows XP early next month, the company has been making some last-ditch attempts to get customers running the software to switch to something a bit more contemporary, pushing a series of very attractive trade-in programs. In the latest, those on Windows XP machines looking to upgrade to Windows 8.1 will, in return for lugging their old rig to their local Microsoft Store, be the recipient of a $100 savings voucher against a purchase of a computer over the $599 mark, and if you’ve been meaning to grab yourself a new computer and still find yourself languishing on XP, now’s the best time to take the plunge. Last week, the software maker began dishing out $50 Microsoft Store vouchers to folks trading in their old Windows XP computers, but with the April 8th cut-off point fast approaching, the Redmond outfit appears to be upping the ante. 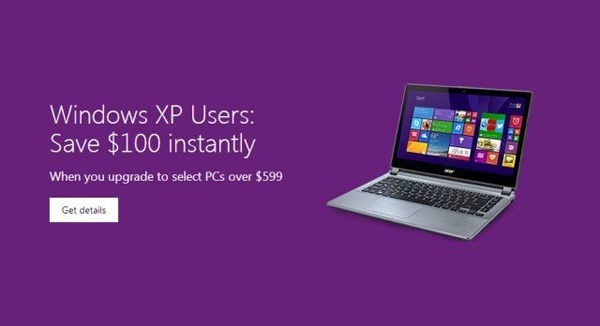 Even though the $599 threshold for the offer is a little bit of a hike if you weren’t planning on getting anything too high-end, XP is now a very dated piece of software, and although it still runs as smoothly as ever, the lack of compatibility with certain apps and products will only become more of a burden as time goes on. The $100-off deal is certainly better than the last offer Microsoft ran, particularly for those in the market for a new computer, and if your setup currently runs on Windows XP, there’s a good chance that you probably ought to be looking at acquiring something more here-and-now. The trade-in offer is good through June 15th, so if you don’t want to make a decision right now, you can survey the market and keep your options open. However, with official support about to end, XP users will soon be left far behind the rest, and unless your computer is capable of a bump to Windows 7 or newer, trade in for something that will tide you over for years to come. Also, if you’re worried about any hassle you may encounter along the way, it should be noted that the discounted PC purchase still comes with the 90 days off support from Microsoft, and there’s also a handy free file transfer tool enabling you to retain your important content.